Costa Rica prides itself on being accessible and inviting to tourists, with travel generally easy and safe and the country has long been recognized as one of the world's best sport fishing destinations. Costa Rica's waters literally teem with big game fish, Dorado, big Yellow Fin Tuna and one of the largest concentrations of big Pacific Sailfish and blue, black, and striped Marlin found anywhere. 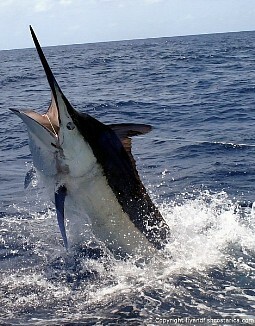 In fact, Costa Rica boasts one of the healthiest Billfish fisheries in the world. Unusually calm waters and short rides to the fishing grounds cement the country's place as one of the top of the big game fishing destinations. Plenty of options await offshore for other big-game pelagics, and inshore you'll find Rooster-fish, Cubera Snapper and more. Central Pacific sport fishing starts at the incredible Los Sueños Resort and 220 slip Marina, located in Herradura Bay only 10 minutes from the nearby beach town of Jacó and just over an hour from Juan Santamaría International Airport in the capital city of San José. With Sailfish averaging around 100 pounds (45 Kg) and greater, you can experience the thrill of Pacific Ocean offshore fishing in beautiful Costa Rica. You can also catch Blue Marlin, Striped Marlin, Dorado averaging 30 pounds (14 Kg), Yellow Fin Tuna and Wahoo. Or if you want to do some inshore fishing, you will be fishing for Rooster-fish, Jacks, Snapper and Grouper. This is blue water conditions at their best in typically flat calm waters, 82°F (27°C) weather and plenty of sun. Those in search of an unforgettable sportfishing experience need to look no further. The Jacó area boasts an eclectic assortment of international restaurants to suit the most discerning palate. If you prefer a more authentic Costa Rica experience you can also enjoy the national cuisine in any of Jacó's many local restaurants or "soda's" as the are known. There are boutiques and shops aplenty for all your beach and surf needs, as well as small souvenir stores if you are looking for a little something special to bring home. If you're looking for nightlife, there is something exciting to do every night in Jacó. Whether you want to dance, listen to live music, have some fun at any of the town's three casinos, or simply enjoy a late dinner, everything is just minutes away. Apart from being an angler's paradise, the area also offers numerous other tourist attractions such as nature reserves, water sports, whale watching and other adventures. In recent years, Costa Rica has increasingly become a popular eco holiday destination. We are currently offering a trip to Tortuga Island, which provides an opportunity to do a combination of fishing, snorkeling and sightseeing.